1. CENTER INSTRUMENT and PEDESTAL lights panel. BLUE - PA (Passenger Address) speech level indication. Also used to arm ground spoilers. In PWR position (picture) the rudder is hydraulically powered. 11. PALM switches (TOGA buttons). Used to set the Flight director in G/A (Go Around) mode. 14. 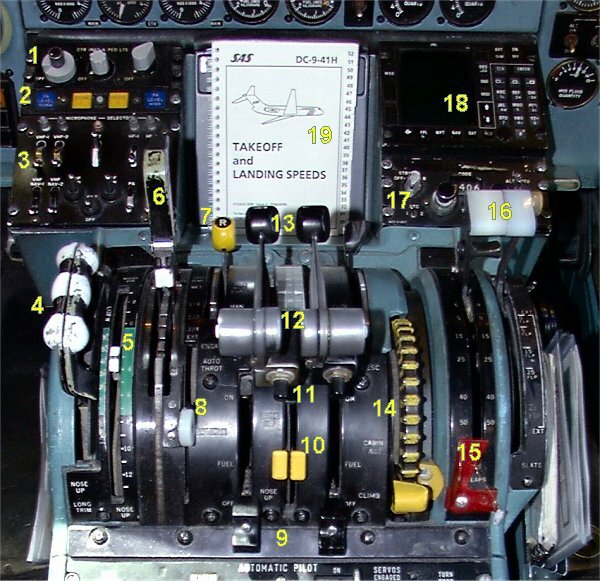 CABIN ALTITUDE control wheel. 15. STOP BAR to prevent the use of 50 degree flap. Normally interconnected. May be used separately in case of emergency. 18. KNS 660 Area Nav System (RNAV). Behind is the weather radar display.